Overall size 19" x 17", image 16" x 12"
There was a lot of activity before the actual dam raids in the form of experimentation - testing to establish the optimum height, airspeed and rate of rotation of the 'Upkeep' mine. Believe it or not, the powers that be were still adjusting these parameter measurements just four days before the actual raids. 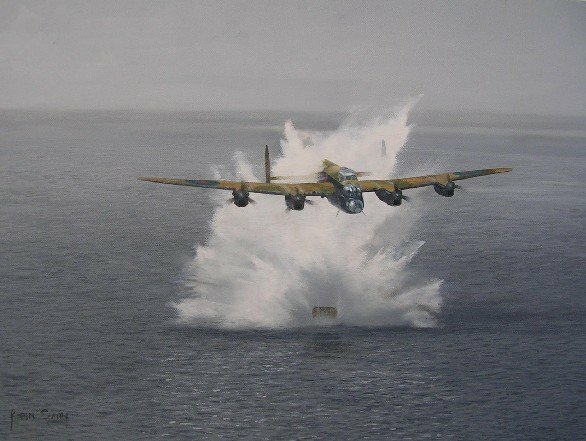 The image depicts Les Munro in his Lancaster AJ-W on the 12th May 1943 taking a smack up the bum from the massive and unpredicted force of the splash. In his own words this was probably due to the aircraft flying too low or too slow. I hope the print will make a valuable addition to any enthusiast's Dambuster collection being rather an unusual slant on the all important build up to the raids.